Limited Edition Print Co-signed by Maria. Edition of 150 Sale price £20 each (was £30) With Free UK Postage. Maria Costello MBE co-signed tribute limited edition print. The image shows Maria Costello riding the Pagetts Suzuki GSXR K2 in the 2004 Isle of Man TT Production 1000 race to her fastest lap of the TT - 114.73mph - in the bottom left of the image. And Maria on the RLR Honda in the 2005 Manx Grand Prix coming down from Kate's Cottage to the famous Creg Ne Baa pub on the Isle of Man on her way to her podium. Below is Maria signing the print at the 2012 Isle of Man TT Races. Above are a couple of work in progress photos of the Maria Costello art in progress. 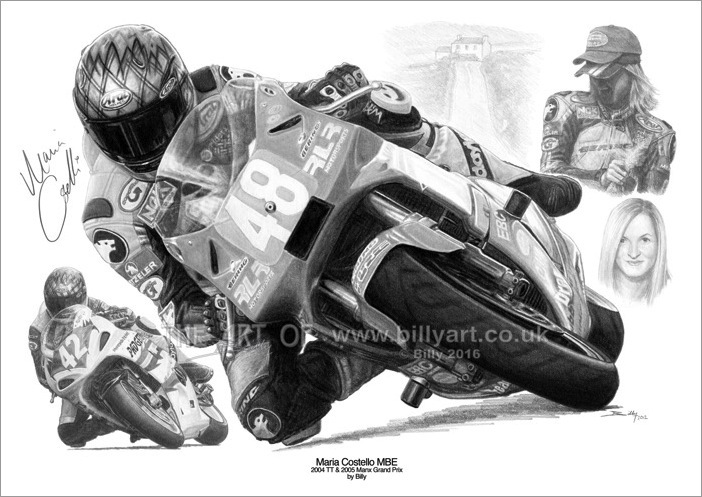 Above are three details of the Maria Costello TT and Manx Grand Prix art. This print has free UK post but I use 'Airsure' or 'International Signed For' for international orders so chose UK or international below to purchase the Maria Costello fine art print. If an international buyer wishes to purchase more than one print then please contact Billy with your requirements and one invoice with one International shipping fee will be sent to you.